Our company is supreme manufacturer of Brass Hose Fittings which are precisely designed and are appreciated for their dimensional accuracy and sturdiness. These Brass Fittings are sourced from the top quality brass to manufacture the Brass Hose Fittings and ensure their quality on several parameters till they are dispatched. We have carved a niche as a reputed exporter and supplier of brass Hose fittings and Brass Terminal Bars made according to the clients requirements. 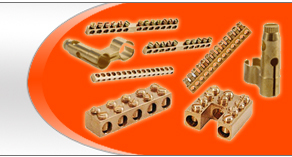 Any kind of Brass Fittings can be Supplied Exactly as per Patron drawings, design, specifications and samples. We also offer hose fittings that come without threads and go manufactured along the international standards for quality control.